The BLE Board and Dance Troupe wish our members, friends and partners a Merry Christmas and a Happy New Year! We look forward to celebrating Greek culture together with all of you in 2018. 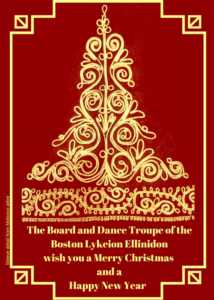 Celebrating Hellenic culture and traditions in New England since 1998, the Boston Lykeion Ellinidon is a volunteer-run, 501(c)(3) non-profit organization dedicated to the preservation and promotion of traditional Greek culture through a rich program of dance performances, classes, workshops, and special events.